Kinsella on Liberty Podcast, Episode 047. This is lecture 3 (of 6) of my 2011 Mises Academy course “Libertarian Controversies.” This talk covered “Even More Misconceptions,” such as state vs. government, “limited” government, Hoppe on monarchy vs. democracy, federalism, restitution and punishment, positive obligations, and other issues. Slides for this lecture are appended below. 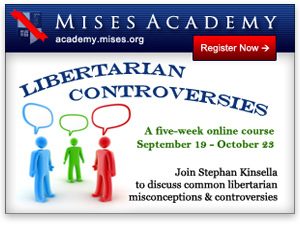 For background information, links to recommended reading, and audio and slides for all six lectures, see KOL 045 | “Libertarian Controversies Lecture 1″ (Mises Academy, 2011). The remaining lectures will be released here in the podcast feed in upcoming days. Update: The videos of all six lectures are now available here; the video for this particular lecture is embedded below.